I found these two chairs and ottoman for $100 with the intention of slipcovering them for my soon to be finished bonus room/workroom/she-shed/study/escape room at the lake. I was looking for matching club chairs that wouldn’t be too big but would be comfortable enough to snuggle up on and were in good condition. Almost immediately after I got them home, I started to doubt my decision. They “looked” stiff and uncomfortable. I considered reselling them and starting over before I invested any more in them, but after further “comfort testing”, I decided it was probably the dark and “office-like” fabric that was getting under my skin. If I found the right fabric, they might just work. Since I’m a hands-on kind of person, I went fabric shopping so I could actually feel the fabric and drape. I found a knobby textured yet soft boucle fabric. It reminds me a little bit of terry cloth, but not snaggy. Normally I don’t recommend upholstery fabric for slipcovers as it is harder to sew, doesn’t have the drape of natural fibers, and isn’t machine washable. Since these chairs had very simple lines, would be in a room with very little traffic and I wasn’t planning on removing them to wash them, I didn’t think this would be a problem. I planned to Scotch Guard them as well. I chose a neutral color so I could accent them with pops of seasonal colored throw pillows. A tan velvet piping and two-inch velvet band on the bottom gave the chairs even more softness and elevated these chairs to another level. I LOVE them. I think they turned out great and now meet all my criteria….matching, comfortable, soft and versatile. My plan was to use these as the fall/winter slipcovers and make something lighter and “lakey” for the spring and summer (stay tuned). That’s the beauty of slipcovers. You can actually change your mind and recover them if you get tired of the fabric or just want to change things up by the season or your mood. 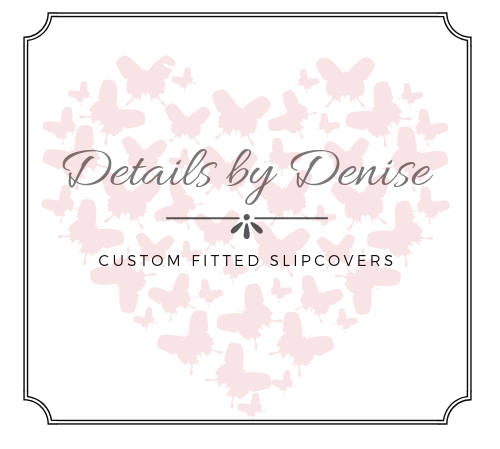 If you are trying to decide if slipcovering is right for you, checkout one of my favorite blogs and inspirations, The Slipcover Maker to know when it is a good idea to go with a slipcover and when it is not.